December 04, 2016 at 1:13 pm. The Heisman Trophy was Lamar Jackson’s to lose. 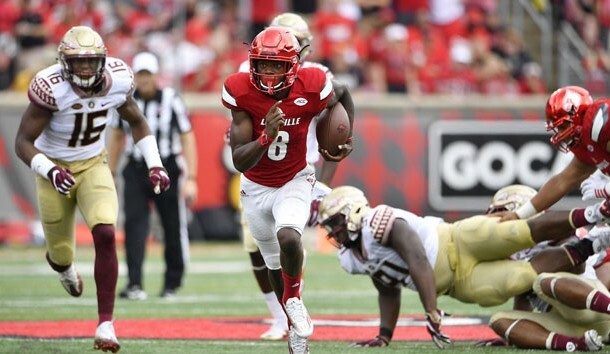 Although the Louisville quarterback handled his grip on the stiff-armed trophy as loosely as the football in the red zone in the final couple of games of the season, Jackson didn’t fumble away his big opportunity. The sophomore will win the Heisman because of his remarkable performance over 12 games. Jackson might have been able to win by historic proportions, if not for the Cardinals’ losses to Houston (he was sacked 11 times) and Kentucky (committed four turnovers) to end the regular season, but that will just be a footnote to the coronation. He sat out last weekend while other prominent players held the stage in conference championship games, but just as Jackson showed on the field, nobody could catch him from behind. For the record, Jackson finished the regular season with 1,538 yards and 21 touchdowns on the ground, and he completed 220 of 382 passes for 3,390 yards, with 30 touchdowns and nine interceptions. Can’t beat that. While he drained the drama out of the race for most of the season, candidates have rotated in the big pack behind him. Heisman voters get to vote for three players, in order. Who’s next after Jackson? The running backs — Texas’ D’Onta Foreman, Florida State’s Dalvin Cook, San Diego State’s Donnel Pumphrey and Christian McCaffrey — will split votes. The receivers? Not this season. Michigan Jabrill Peppers — let’s call him a linebacker to save space — is the ultimate hybrid, but Alabama defensive lineman Jonathan Allen is the rock for the nation’s best defense. Two good choices. And, of course, let’s not forget that this is usually an award for quarterbacks, and Deshaun Watson did steer Clemson back into the playoff with some spectacular moments. That he was still about 500 yards behind Jackson in total offense, despite one more game, emphasizes how great Jackson was in 2016. See you next year, when USC quarterback Sam Darnold wins it. 1. The Pac-12 needs to move its championship game on campus. The announced attendance of 47,118 offered a reminder that the title game at the San Francisco 49ers home in Santa Clara is a dull alternative to a packed campus site. Either that, or prepare to move to Las Vegas when the city builds its NFL palace. 2. Heisman voting should not begin early. Why can voters even cast a ballot before championship weekend? What’s the rush? Voting can be done in a minute on-line. Don’t open the website until Saturday night when the games are done and all the information is available. 3. Houston outclasses Liberty. Houston took the very unusual step of submitting a statement to dispute that Art Briles, tainted by Baylor’s sexual-violence scandal, would be interviewed for the Cougars’ head coaching position. Liberty, a Christian school that touts a culture of being a “Champion for Christ” also took an unusual step. It hired former Baylor athletic director Ian McCaw, similarly tainted, to lead its athletic department. 4. Careful when evaluation scheduling intent. By all means, examine strength of schedule when comparing teams from different conferences, but beware of saying “Team X scheduled softly” while “Team Y challenged itself.” Submitted for evidence: When Michigan scheduled Colorado, the Buffaloes were coming off six straight losing seasons. When Washington scheduled Rutgers, the Knights had posted 24 victories in three years. When you schedule three or four years in advance, the opponent is often like a box of chocolates. 5. Notre Dame gets a final win. But only for being the most disappointing team of 2016. It would be easy to slot Michigan State — from the playoff to out of the bowl picture — but the Irish were at least considered a fringe playoff team heading into the season before collapsing into a 4-8 mess that made Brian Kelly’s job security a top topic. 6. The Pac-12 North still rules. The division has won all six conference title games over the South, by a combined score of 247-114. But wait. Not only has the winner of the South lost all six championship games, the previous five also went on to lose its bowl game. You have been warned, Colorado. 7. James Conner was the best individual story of the year. The Pitt running back, a former ACC Offensive Player of the year, came back from a knee injury — and Hodgkin’s lymphoma — to rush for 1,060 yards and 16 touchdowns this season. He finished tied for third in the ACC Player of the Year voting. 9. Alabama might be vulnerable in the playoff semifinals. We say that only because Nick Saban, with Saturday’s victory over Florida to win the SEC, has won his past nine “championship” games — five in the SEC and four that decided the national title. 10. This could be our way-too-early top five for 2017. In no particular order, Alabama, USC, Ohio State, Michigan, Washington. 1. Brian Kelly, Notre Dame. The 2017 season was a dumpster fire, and Kelly doesn’t seem capable of taking public responsibility for any of it. 2. Jim Mora, UCLA. He might have been protected by a nearly $15 million buyout, but there’s only so much patience the school can have with a trending-down program that is getting lapped by USC. Mora has recruited like an ace, and he will get back quarterback Josh Rosen next season, but UCLA expects more than treading water. Mora, who went 4-8 overall this year, is 25-20 in conference games in five seasons. 3. Butch Jones, Tennessee. This was supposed to be THE year for the Vols, who instead finished 8-4 and ceded a ripe-for-the-pickings SEC East to Florida. Yes, Tennessee was buried under an avalanche of injuries, but Jones’ title-free 29-21 record in four years is exactly the kind of thing that gets coaches fired in the SEC. 4. Kliff Kingsbury, Texas Tech. The school announced it will retain the 37-year-old offensive whiz, but Kingsbury is only 24-26 in four seasons while his teams play some of the worst defense in America. 5. Coaches in Arizona. Neither Arizona (Rich Rodriguez) nor Arizona State (Todd Graham) feels the urgency right now after the teams combined for a 3-15 conference record. But each of these guys will be entering their sixth season, with memories of Pac-12 South 12 titles quickly fading. 1. Jarrett Stidham. The former Baylor quarterback, who spent this season at a junior college in Texas, is dropping a lot of hints that he will join Auburn next season. Stidham impressed as a dual-threat true freshman with the Bears, and he is exactly what Gus Malzahn needs to infuse zip back into his attack. 2. Malik Zaire. He lost his job to DeShone Kizer early in the season at Notre Dame and is looking for a fresh start as a graduate transfer. He has flashed occasional brilliance as a runner and passer — perhaps all that has been lacking is consistent playing time. 3. Kyle Allen. He left Texas A&M for Houston, but now as a graduate transfer with two seasons of eligibility remaining, he could follow coach Tom Herman to Texas. 4. Blake Barnett. Alabama’s season-opening quarterback left school soon after true freshman Jalen Hurts won the job, and Barnett, enrolled in a California junior college, has been making the Pac-12 rounds — Washington State, Arizona State, Cal and Oregon. 5. Max Browne. The USC gig was supposed to be his after he waited three years as the backup, but he was usurped in the fourth game by redshirt freshman Sam Darnold. Browne quickly announced he would transfer but stuck with the team until last week, when he announced he was leaving the squad to find a new home as a grad transfer.